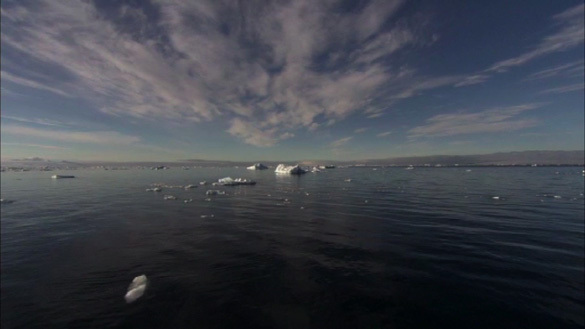 BJNilsen performs alongside “South”, a film by John Aitchison shot in the South Atlantic and edited by BJNilsen. 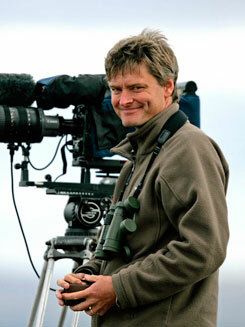 John is a wildlife filmmaker who works for the independent production company Otter Films Ltd. Otter Films has worked with the BBC, National Geographic, PBS and Discovery Channel on series including Planet Earth II, The Hunt, Frozen Planet, Life Stories, Life, Big Cat Diary, Springwatch and Yellowstone. The BBC's Natural World series commissioned Otter Films to produce a programme featuring David Attenborough's quest to discover what amber can tell us about the past. You can watch it in The Amber Time Machine post on this site. You can download a list of productions here. Planet Earth II, is a new BBC1 series, first shown in autumn 2016. John helped film the Wilson's bird of paradise for the Jungles episode, as well as hyenas in Ethiopia and catfish in France for the Cities episode. John also filmed the peregrines that live in New York for the Cities episode of Planet Earth II. There's a chapter about this in The Shark and the Albatross. Recently he has also been working on Dynasties: Lions (for BBC1 in 2018), a Disney Nature documentary and Our Planet, a series for Netflix. 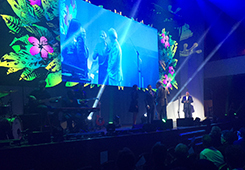 The Hunt, produced for BBC 1, BBC Worldwide and BBC America by Silverback Films, won panda awards at Wildscreen 2016 for its editing, music and cinematography. John was honoured to be asked to collect the cinematography award, with Sophie Darlington, on behalf of the camera team. What is it like to spend a month filming the animals of a rainforest in Venezuela, from a platform 25m up a tree? In this programme for the Nature series on BBC Radio 4, John describes the experience of filming a young harpy eagle learning to hunt monkeys and its first surprising encounter with a sloth. On 24th April 2016 The Hunt's camera team was awarded a BAFTA for Factual Photography. In March John spoke about making wildlife films to 800 people at the Royal Geographical Society and to a smaller group, the following day, at the Linnean Society of London, where the natural history specimen collection and library of Carl Linneas are held. John filmed Amur falcons for the introductory programme, sparrowhawks and jays, harpy eagles and a sloth, and pine martens for the forests episode, peregrines for the coastal episode and snow geese for the plains episode. In November 2015 John delivered the Prologue at Nature Matters, an inspiring event which draws together artists and scientists interested in the natural world and its preservation. The theme was 'Place and Belonging'. Anyone with an interest in wildlife, conservation and creativity would enormously enjoy these very stimulating annual events. The next one will take place in Stanford in November 2017. There are some details of the 2015 event here and the text of John's prologue to the event is here. The short film mentioned in the text is this one about finding beauty in nature. John took part in the Edinburgh International Book Festival in August. The webpage for the event is here. Martha was the last of her kind. The passenger pigeon was once the most numerous bird in North America and perhaps the world. Martha died in Cincinnati zoo in 1914. One human generation earlier her species had been counted in the billions. In this radio programme, produced by Sarah Blunt with wildlife sound recordings by Chris Watson, John explores how this unthinkable extinction happened and what we can learn from Martha's sad tale. To lean more about Martha and listen to the programme you can visit the programme's website here. In October 2014 the Hebrides series was awarded the panda for Best Series at Wildscreen, the biennial wildlife film festival held in Bristol. The judges described it as, "a very well crafted series. The filmmakers clear vision brought the landscape, wildlife and people together into a very engaging story." In May 2014 the Hebrides series was honoured with an award for excellence in cinematography by the UK's Guild of Television Cameramen. John presented several Tweet of the Day programmes on Radio 4. You can listen to them here. 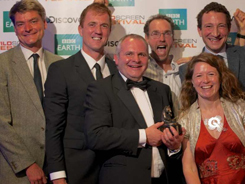 In September 2013 the camera team for Frozen Planet won the Best Cinematography award at Jackson Hole. 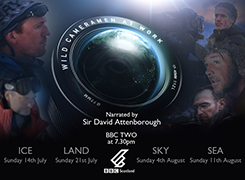 The 3rd series of these programmes about filming wildlife was repeated on BBC Radio 4 in August 2013. If you missed it you can listen to all five episodes here. John was part of a team filming coastal brown bears in Alaska for a documentary feature for Disney Nature, released first in the USA in April 2014. The series website and clips are here. John spent 240 days filing the topside wildlife for this four part series. Doug Anderson filmed underwater. Nigel Pope was the exec/series producer and produced prog 1, John produced prog 2, Sue Western edit-produced prog 3, Kate Munro and Amanda Reilly produced prog 4. Editing by Nick Carline, Martin Elsbury and Alex Broad. 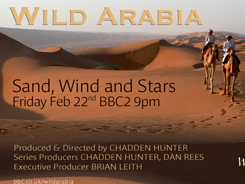 It's a Maramedia production in association with Otter Films and was commissioned by BBC Scotland. A quarter of Scots watched the first episode. The series website, with video clips, is here. The series trailer is on YouTube here. "It's one of the most beautiful films I have seen". 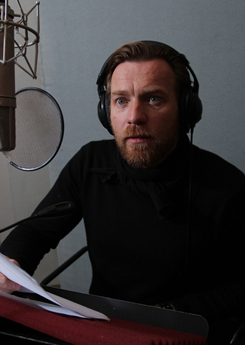 John directed Ewan's narration for the second programme. It was a real pleasure to see how much skill and intelligence Ewan brought to all the films. 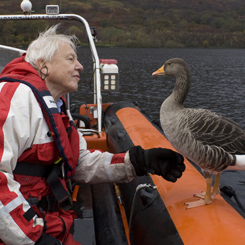 John filmed with Sir David Attenborough and Lloyd and Rose Bucks' imprinted greylag geese on Loch Lomond for David's next BBC series, Sixty Years in the Wild. The series was shown in November 2012. There is a clip here. 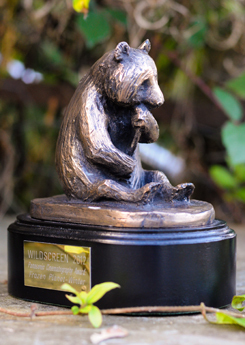 At the Wildscreen festival in Bristol on October 18th 2012 Frozen Planet was honoured with Panda awards for sound, best series and cinematography. Nigel Wilkes of Panasonic UK presented the Cinematography Panda to John, Mark Smith, Doug Anderson and Hugh Miller, on behalf of the many cameramen in the team. 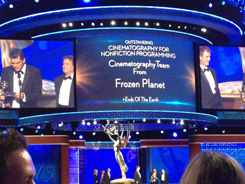 In Los Angeles in September 2012 Frozen Planet 'Ends of the Earth' won the Primetime Creative Emmy for Outstanding Cinematography for a Non-fiction Programme and the Emmys for Non-Fiction Picture Editing and Sound editing. The series also won the Outstanding Non-Fiction Series Emmy. Well done everyone! 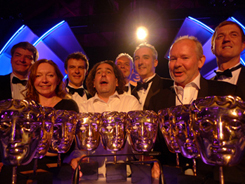 On 13th May 2012 Frozen Planet won Craft BAFTAs for cinematography, editing and sound. John and underwater cameraman Doug Anderson collected the Cinematography BAFTA. The Winter episode has also won the Royal Television Society award for Cinematography and the series won Best Cinematography at the International Wildlife Film Festival in Missoula as well as several other awards there. Otter Films have recently run several wildlife film-making training courses for rangers from the National Trust for Scotland. The Trust has some outstanding properties with world-class wildlife, like St Kilda and Mar Lodge. John gave an after-dinner speech to more than 600 people at the RSPB Members' Weekend at York University and spoke at the Hampshire & Isle of Wight Wildlife Trust's 50th Anniversary Celebration Event. Are you trying to get started in wildlife filming? You can download some advice and suggestions here.